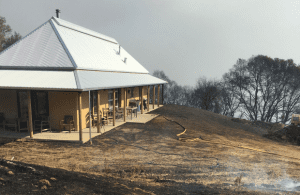 This straw bale home in the Redwood Valley stood its ground against massive wildfires. The recent wildfires in California have created massive devastation across the state; however, they have also given us an opportunity to see, first hand, just how well straw bale structures perform in wildfires. David Arkin of Arkin-Tilt Architects recently released a report through the California Straw Building Association (CASBA), that documents the performance of four straw bale homes. Although sad to see, the evidence provided in this report is invaluable. As a long time straw bale builder, teacher, and advocate, I have always touted the performance of straw bale structures in wildfires, as have many other advocates from architects and engineers to builders and home owners alike. Even with this flow of positive reinforcement regarding their performance and resistance to flame spread, some building officials have wanted to see more “concrete” proof of that performance. Let’s go back in time a bit to gain some perspective on what’s been accomplished regarding the effort to prove the fire resistance of straw bale structures. In July of 2006, the Ecological Building Network created the “straw bale fire test program” and tested a series of wall assemblies at Intertek Testing Services in San Antonio, Texas. In that process, they were able to show that a bale wall assembly is capable of passing ASTM standards for a rated, two-hour fire wall. That’s far superior to conventional wall ratings, which typically come in around 20 minutes. You can watch a video about the testing process and the results below. This was an important step in solidifying the data we needed to prove to building officials that straw bale wall assemblies are in fact excellent at resisting flame spread. The wildfires in California have given us the anecdotal data to go along with the empirical data of the ASTM testing. The CASBA report documents four case studies of straw bale homes with photographic evidence, owner input, and architect site visits. There’s no doubt that the fires damaged the buildings, in some cases with devastating results; however, even the home that was destroyed shows strong evidence that the straw walls performed far better than the conventionally stick-framed sections. You can read the report here and see for yourself just how impressive straw bale homes are in regards to resisting flame spread. I’d like to thank David Arkin and the folks at CASBA for creating these case studies. By the way, if you’re not already a CASBA member, please consider becoming one today by clicking here. I’d also like to thank the owners of the homes who have openly shared their experiences so that we can all learn and benefit from them. Keep in mind that these homeowners have just weathered massive wildfires and, in one case, lost their beautiful straw bale structure. Their decision to share their stories with us is no less than gracious, so please join me in sending a heartfelt thank you to them as well. Hi Andrew, Thank you for sharing this information! I will be sure to pass it along to my construction and engineering colleagues in Arkansas as well. We have very few strawbale structures in the state, so it was quite the process to get everything cleared to build my home in northwest Arkansas. Information like this will help to educate all of us so we can continue to tout the benefits of sustainable building. I’ll be very curious to know how the insurance claims are handles for these homeowners and I send my thoughts and prayers to all those that have been affected by this devastation! Our straw bale house, which Andrew helped us with, survived the Helena fire. It came five feet from the back door, and ten feet on the north side. The Costco shed ten feet from our back door full of miscellaneous stuff including building materials is now ash. Our neighbors on both sides, not so lucky. There are 12 houses in our immediate neighborhood and there are five of us still standing. None of us went unscathed. I would say that there were a few factors that saved our house. The first being the inches of plaster on our walls. The others were we are located on level river tailings, so our defensible space us excellent, as well as we keep our nearby trees trimmed away from the house, we also have cement board covering our soffets. Our vulnerable places were our wooden decks, which I watered down before we were evacuated and our comp roof, although better than a shake roof not as good as metal. Also we have our fire wood against a wall under a window, which I thought to throw far away from the house before leaving. We also took with us the barbeque gas tank. All of this in the 20 minutes we had to leave. Need less to say I left with very much because I was so determined to do what ever I could to save the house. I am happy to say our building inspector was truly glad our house survived, he was one that was rooting for us. I think that a straw bale house, taking wild fire precautions and the visualization of our house being spared and the sprinkler on the back side as we drove away all helped. It was about three hours into it we lost our pump house which housed the water system, electricity. One who stayed through it, said the fire went through and then turned back a burned back. We were lucky to not have any smoke damage inside either as the Windows were closed, and the straw acted like a filter. My heart goes out to anybody who lost their home in these fires that tore through California this year. It is a terrifying experience. I was so worried about you guys and so elated when Michael shared the good news! Yes, sad for so many, and yet, happy for you. My deepest sympathies to all of you who lost your homes in the recent “wild fires”, and to those of you that lost loved ones, its such a devastating experience and something that will take such a long time to recover from with scars left forever. I know from my personal experience with fire the loss and angst that you would have all felt losing all your possessions and life long dreams. For those of you who were lucky enough to have remained intact or relatively at least your experience has answered a lot of questions that came to mind over the years that I have been following Andrew’s Straw Bale reports and emails. I live in Australia and have wanted to build in this way for 20 years, now after seeing the success against fire I am thinking of going ahead with this dream and making it a reality. I have built in Pole Frame with rock and cement infill in past projects. Thank you all for sharing your experiences and vulnerability’s with your buildings and may God Bless you all to remain strong in spirit. Thank you Andrew for your concern. I think everyone’s good wishes helped save the house. I have to say to see the Napa straw bale houses endure what they did reinforces my confidence in our choice of our structure. I am glad that the bale association used these places as a further study to fortify the resilience straw bale building has. Our landscape is changed for our life time, but we still have a cozy house to be in. And by the way, Andrew, Tony’s little place survived. The fire went around his little island. Unfortunately his tools were in the carport we lost, but he got to upgrade. I can only imagine how the landscape is so different now. That must be a difficult reality to come to grips with; however, as you say, you still have the home and that’s what matters most! Ignition resistance is the key to home survival. The vast majority of structure losses in wildland fire events results from ember attack/glowing combustion. This is true for straw bale, stick-built, and masonry homes. Ignition-resistant building/building materials combined with some vegetation management will dramatically improve the survivability of the structure. The National Fire Protection Association (NFPA) delivers a two day course and much of the information can be found at firewise.org. Absolutely correct. That is why straw bale structures (typically wrapped in fire resistant plaster) perform so well. The ASTM testing revealed that a typical straw bale wall assembly has up to THREE TIMES the “burn time resistance” of a conventional wall. In other words, the walls are much less likely to fail and burn under the same conditions as a conventional structure. Of course, it’s very important to extend the protection beyond just the walls. Providing flame resistant roofing, soffit material, and decks is important as is creating a defensible space around the home regarding vegetation. Making sure there is no debris in foundation vents, under decks, and in the eave vents is very important as well. 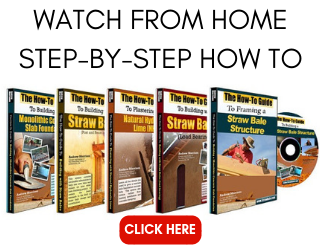 This is great information to have about straw built home. Those fires in California last year were just devastating. There wasn’t much of anything that survived the path of those fires. Thanks you for sharing. 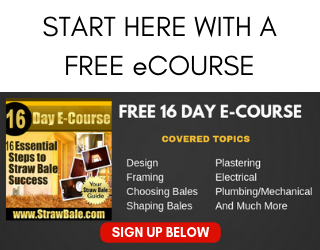 I was wondering if you have ever heard of a strawbale yurt style house? I have not yet found anything like that, and was wondering if straw baling would work well with this concept. Hi Virginia. Yes indeed. 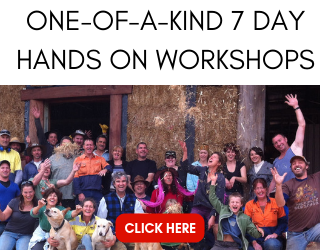 It’s absolutely possible to build a straw bale yurt-style structure. It would, of course, not be something that you could move in the same way as a traditional yurt, but the shape and styling can be matched.